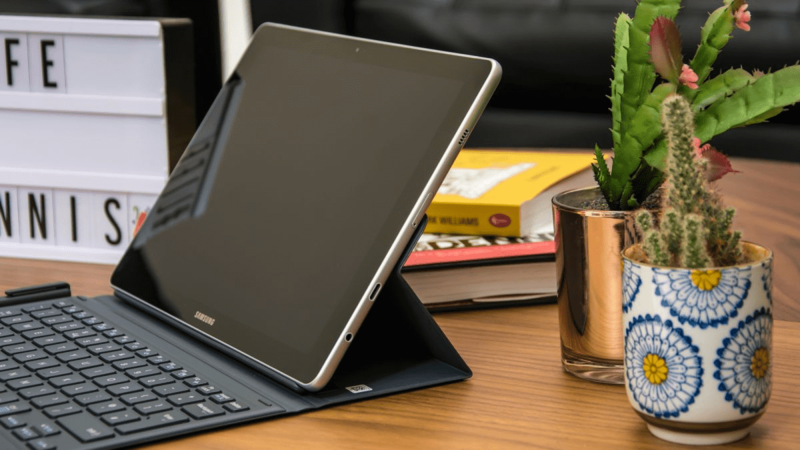 JOINING THE LENOVO Miix 510 in an attempt on the Surface Pro’s supremacy is the Samsung Galaxy Book. Like its spiritual predecessor, the Galaxy TabPro S, it’s a Windows-powered 2-in-1, and this time comes in both 10.6in and 12in varieties. We reviewed the smaller model. 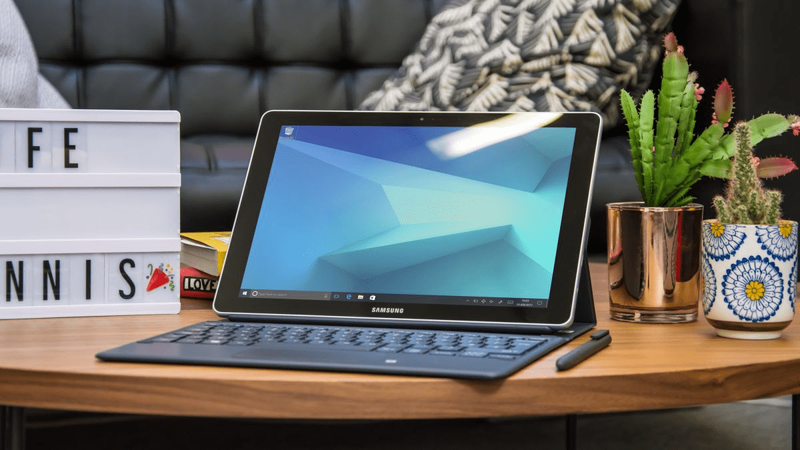 If you’ve seen the TabPro S, the Galaxy Book will look very familiar; put the two side by side and you’d struggle to tell them apart, aside from the Galaxy Book’s more powerful hardware making it a little chunkier. It’s 8.9mm thick, which is noticeably fatter than Apple’s 10.5in iPad Pro and a hair thicker than the 2017 Surface Pro. Its bland plastic shell isn’t what we’ve come to expect of Samsung of late, though. The faux gun-metal trim might give off the illusion of aluminium from a distance, but don’t let that fool you: this feels more like a mid-range tablet than a premium 2-in-1. reserved for the set of magnetic contacts for connecting the folio-style keyboard. 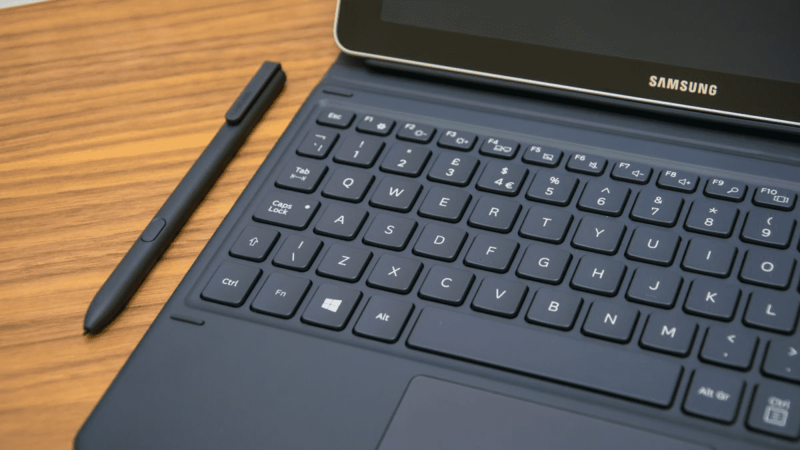 The Galaxy Book’s keyboard is its stand-out feature, and it’s included in the box. It clips on securely, and folds up to form a triangular stand at the back, in a similar way to Apple’s Smart covers. It can only be rested in two positions, so it isn’t always possible to position the display at the most comfortable angle. 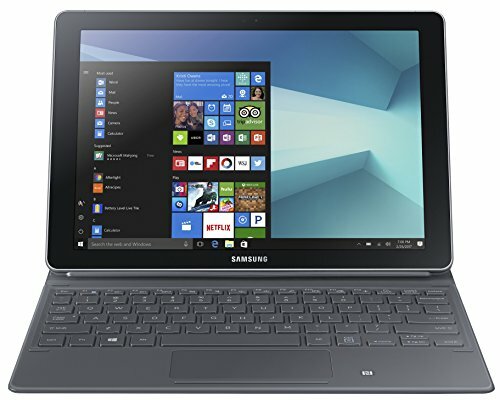 Nonetheless, actually typing on the Galaxy Book’s keyboard is far more comfortable than on any other recent hybrid. Its keys are a joy to type on, with plenty of movement to each keystroke, and a satisfyingly clicky feel. This is as good as clip-on keyboards get. Our only complaint is that the keys are fairly small, causing us to sometimes hit two keys at a time. This is a minor issue in practice, and it’s a downside shared by pretty much every other 10in tablet on the market. The tiny touchpad is excellent. It’s nice and smooth to run your fingers across, and works perfectly in tandem with Windows 10’s multitouch gestures. In fact, despite its limited real estate, it works pretty much perfectly. 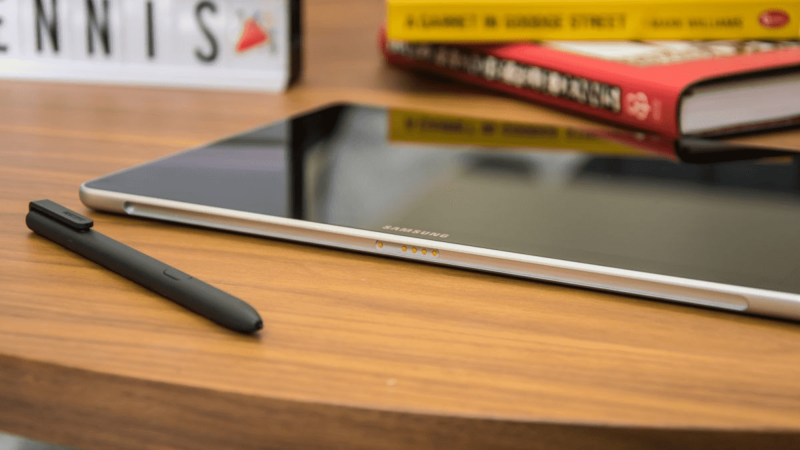 The Galaxy Book also comes with Samsung’s S-Pen stylus. It’s nice and light in the hand, and this makes it easier to make the most of the 2,048 levels of pressure sensitivity than previous Samsung styluses. What’s more, it doesn’t need a battery, cleverly drawing wireless power from the tablet instead. The display on this 10.6in Galaxy Book is a solid all-rounder. Color reproduction is top notch, with bright whites and generously deep blacks. Maximum brightness reaches a respectable 387cd/m2, and a contrast ratio of 928:1 is on the money, too. Color accuracy is excellent, meanwhile, with an average delta-E of 1.64 proving that Samsung’s panel is capable of reproducing colors accurately. Both the 10.6in and 12in Galaxy Book share a display resolution of 1,920×1,280, which makes for a pleasingly crisp display, but there’s one crucial difference. While the Book 10 uses a standard LCD panel, the Book 12 features a Super AMOLED display that also supports HDR, which promises a dramatic bump up in image quality. It’s a shame this wasn’t adapted for the smaller model as well. The 10.6in Galaxy Book is powered by a modest 1GHz Intel Core m3-7y30 processor, 8GB of RAM and 64GB of eMMC storage, which is expandable via microSD. It’s dramatically less potent than the Intel Core i5-7200U in the 12in model, which comes in two flavors: with 4GB of RAM and 128GB SSD, or 8GB of RAM and a 256GB SSD. The 10.6in model acquits itself well in use, though. Windows 10 feels super-smooth, with no hint of lag in touchpad or touchscreen gestures, or day-to-day internet browsing. In our 4K benchmarks, the Galaxy Book scored 25, just a few points lower than the Miix 510 and the Asus Transformer 3 Pro. In Geekbench 4, it reached a multicore score of 5,526 and a single-core result of 2,946, which puts it ahead of the entry-level Core m3 Surface Pro’s scores of 5,417 and 2,469. It can’t keep up with Apple’s 10.5in iPad Pro, however, which scored 9,184 and 3,815. Battery life isn’t a high point. A result of 7h 18m in our video playback test suggests that the Galaxy Book should have enough reserves to get you through a full working day, at least under light use, but it’s behind its key competitors. The 10.5in iPad Pro, for instance, lasted 12h 59m in the same test. 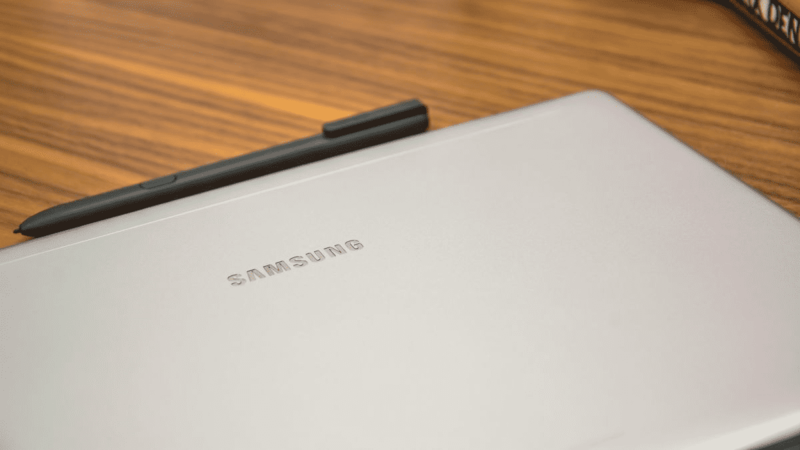 Samsung may not have delivered a knockout blow against the Surface family, but the 10.6in Galaxy Book does land a few hits. It’s not the most luxurious-feeling device, but this hybrid provides a keen balance of price, performance and usability – and the excellent keyboard and stylus are included. © 2018 Top New Review. All rights reserved.